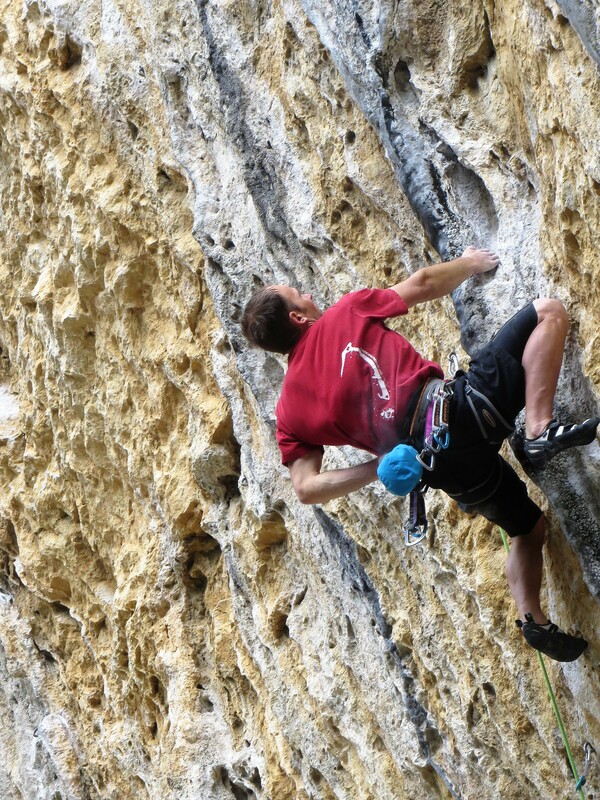 World class tufa climbing at Baume Rousse, France. Photo Logan Anderson. 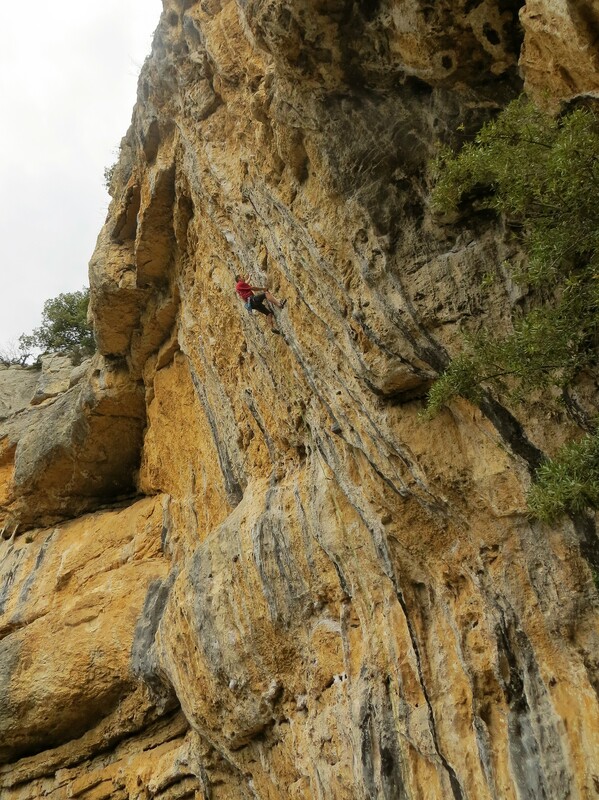 As mentioned in the last post, it rained heavily during the first part of our trip, so for our second climbing day we picked a crag called Baume Rousse, somewhat sheltered in a natural cirque, and close to our home base of Buis-les Baronnies. Before getting into the climbing, Buis deserves a short description. This village of about 2500 people is nestled in an incredible valley, surrounded by impressive peaks and limestone cliffbands. 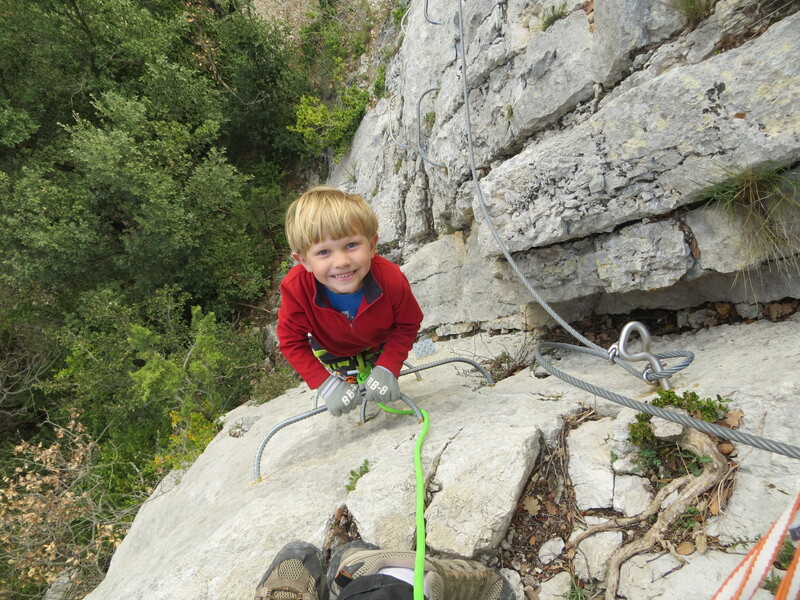 There are three extensive limestone sport crags within walking distance of town (Baume Rousse, Ubrieux, and St. Julien), and another five or so within a 30 minute drive. 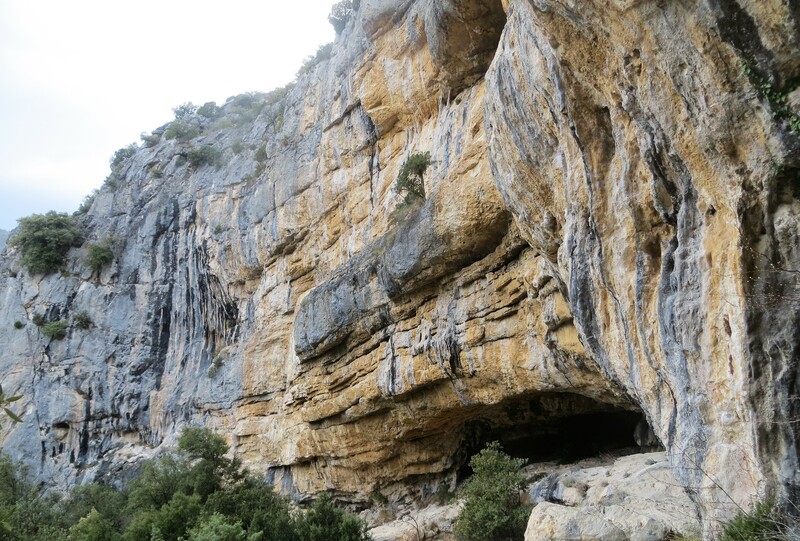 There’s literally a lifetime of climbing opportunities with an hour’s drive. Buis-les-Baronnies from Baume Rousse, with the limestone fin of St. Julien just above town, and the snow-capped Mount Ventoux in the background. 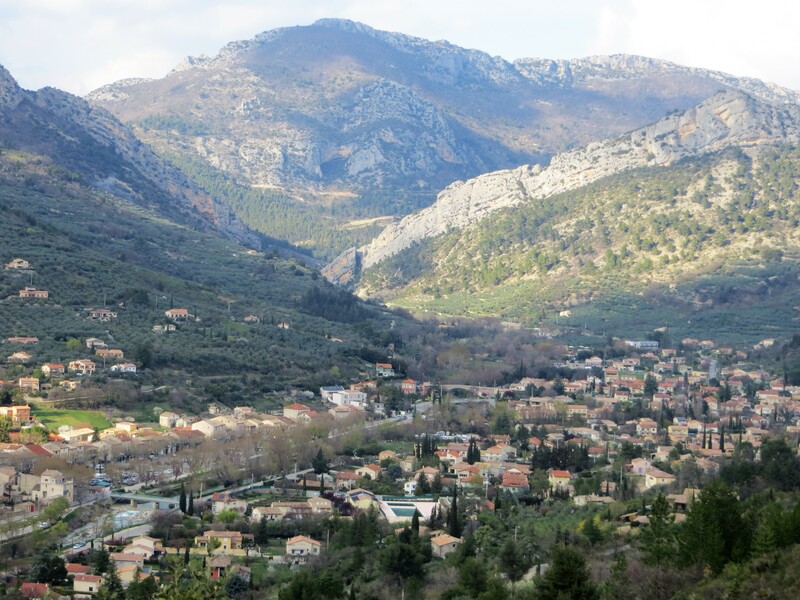 St Leger is nestled in between Ventoux and the next ridge behind St. Julien, about a 25-minute drive from Buis. 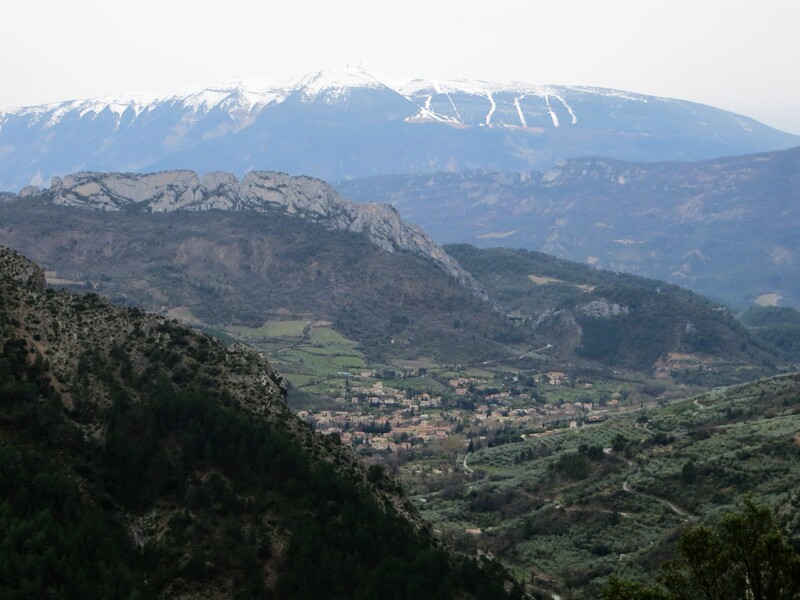 The piercing limestone fin of St. Julien dominates the skyline above Buis-les-Baronnies. 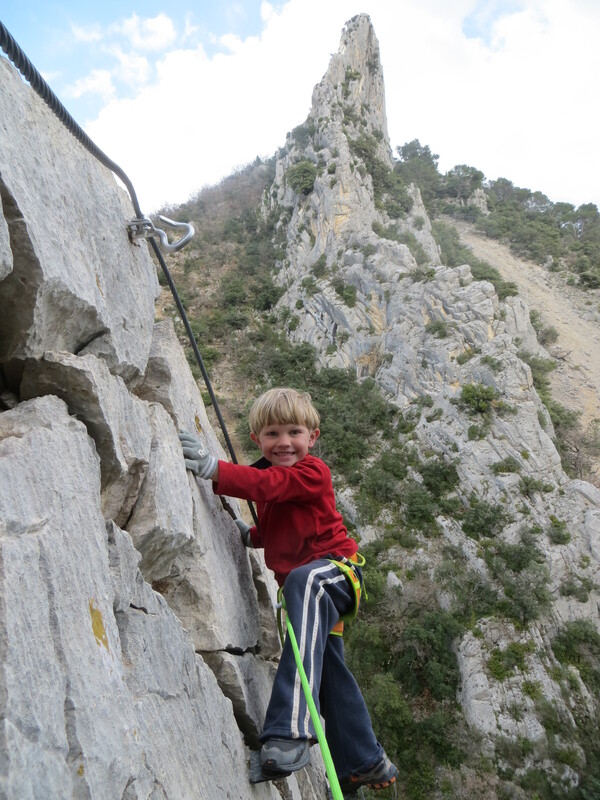 The crag features ~100 routes, including many multi-pitch lines and a network of via Ferrata. A pair of climbers low on St. Julien (in yellow and blue, near the bottom of the cliff, in the center of the frame, at the same height as the tallest tree). 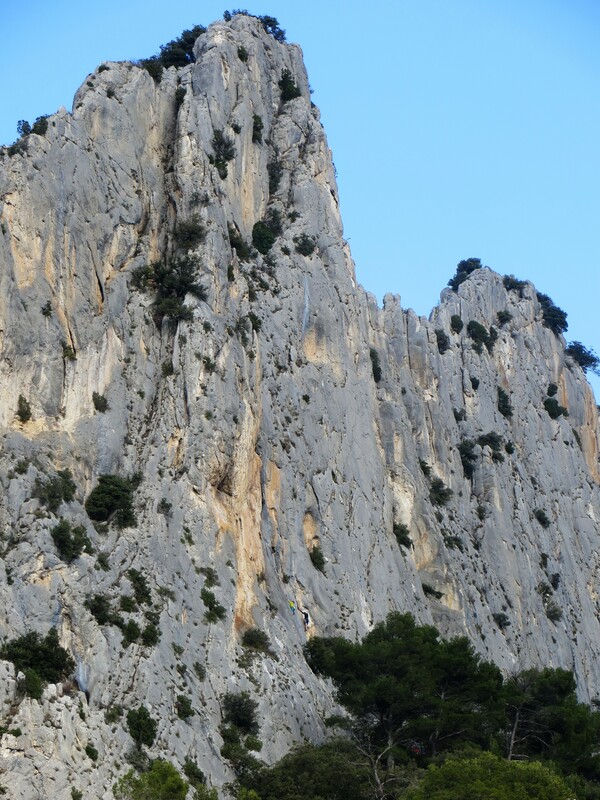 Baume Rousse is a smaller crag with only about 100 routes, but the hardest of those routes climb some of the most amazing tufas I’ve ever seen! 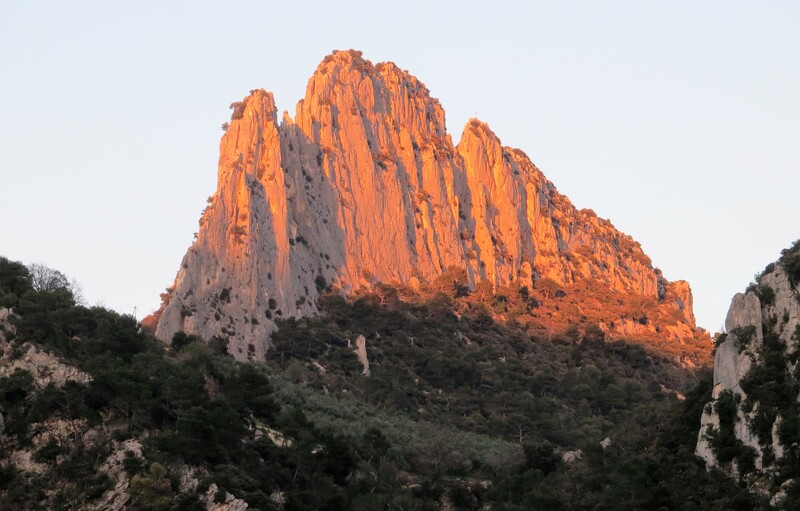 Besides its amazing orange & black streaked limestone, Baume Rousse is unusual because it was developed in order to host a climbing comp in the 1990’s (fortunately the rock was not chipped to engineer the comp routes like at some other outdoor comps of the era). The left half of the Baume Rousse cirque. Looking straight up at the tufa curtains on the back wall of Baume Rousse. By far the best route I did on the trip was an 8a called Rigpa ou la Nature de l’esprit (Google doesn’t seem to know what “Rigpa” means, but the rest of it has something to do with “the nature of the mind”). 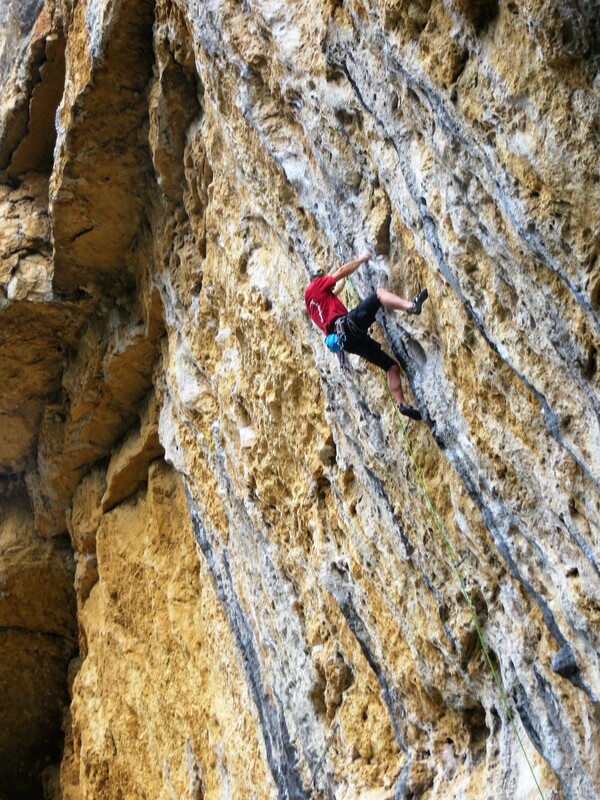 The route follows a phenomenal tufa fin which juts out from the wall as much as 16” but is never more than 2” thick. It’s a classic pumpfest, maybe 15 degrees overhanging, with strategic exotic rests. The tufas fade near the top, requiring some big reaches between features. Rigpa ou la Nature de l’esprit. Photo Logan Anderson. 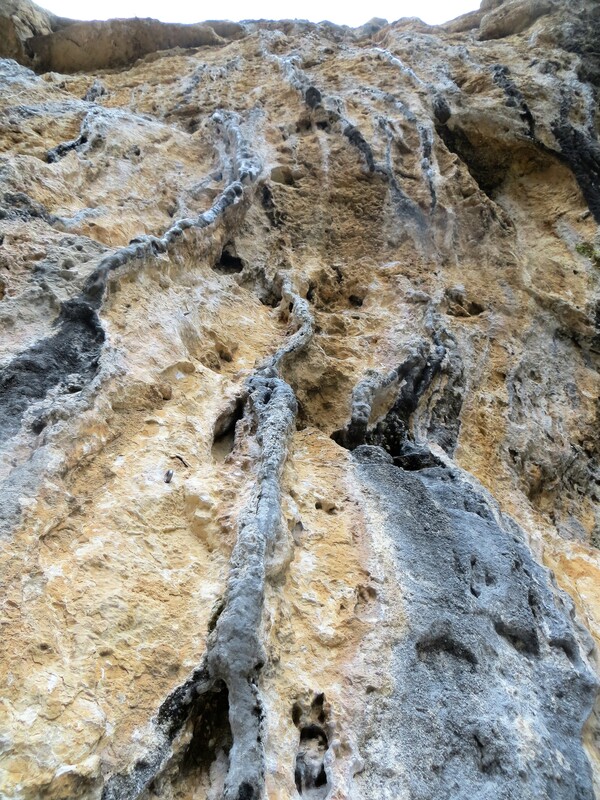 Just to the right of Rigpa is another tufa-laden 8a. I tried that line next, but just as I finished it started raining heavily. Thanks to strong swirling winds we found the little cirque was not quite as sheltered as we hoped, so we decided to pack it in for the day. 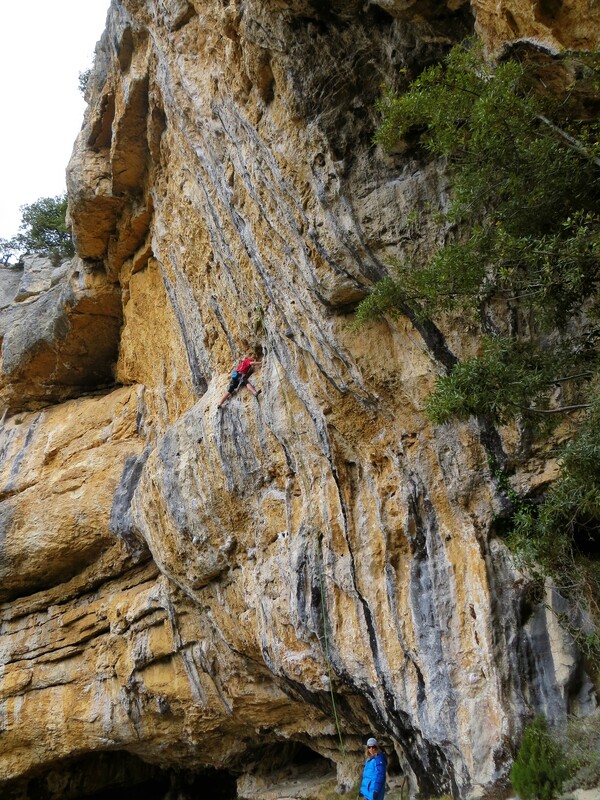 The entire back wall of the cirque is covered in awesome tufas curtains, and if I had one more (dry) day in Buis, I would head straight to Baume Rousse to try more of these amazing climbs. 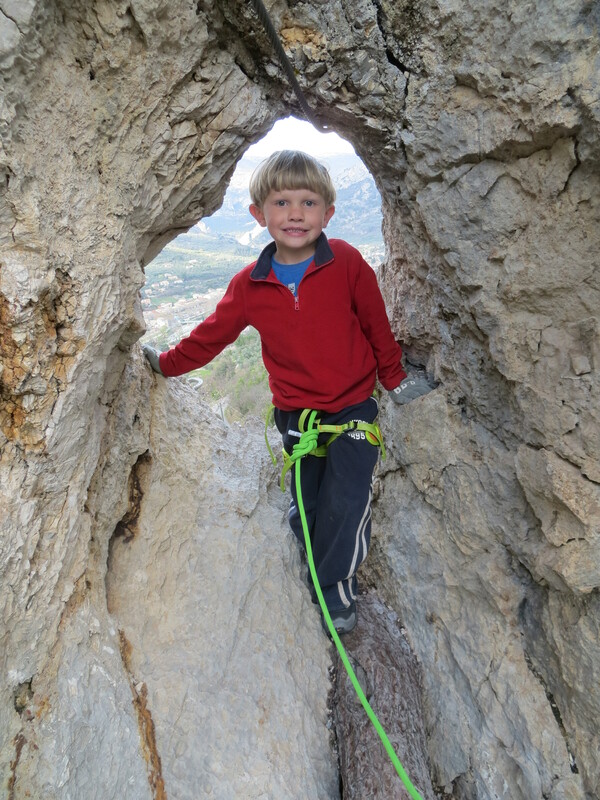 One of the highlights of the trip for me (and I think Logan as well) was a short, entry-level via Ferrata I did with him at the base of St. Julien. Like most things at this age, it took a bit of prodding to get him interested, but once we got started he was instantly stoked. I think the pictures illustrate best how much fun we had. Before we were finished he started campaigning to do another, harder, higher via ferrata, and he kept bringing it up throughout the rest of the trip. Unfortunately these are engineered with a certain minimum height in mind, and there wasn’t another one around that was suitable for 6-year-olds. 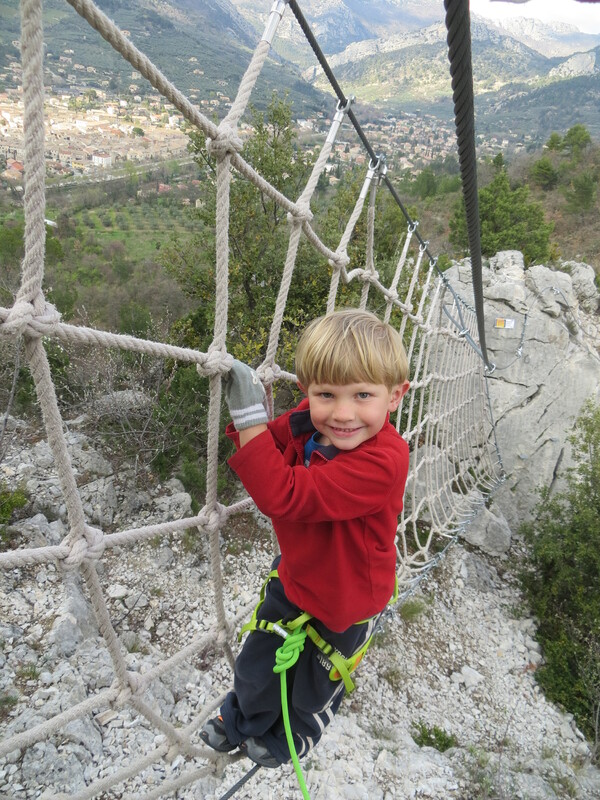 Starting up the first few iron rungs of the via ferrata. The look of half fear/half excitement in Logan’s eyes says it all. 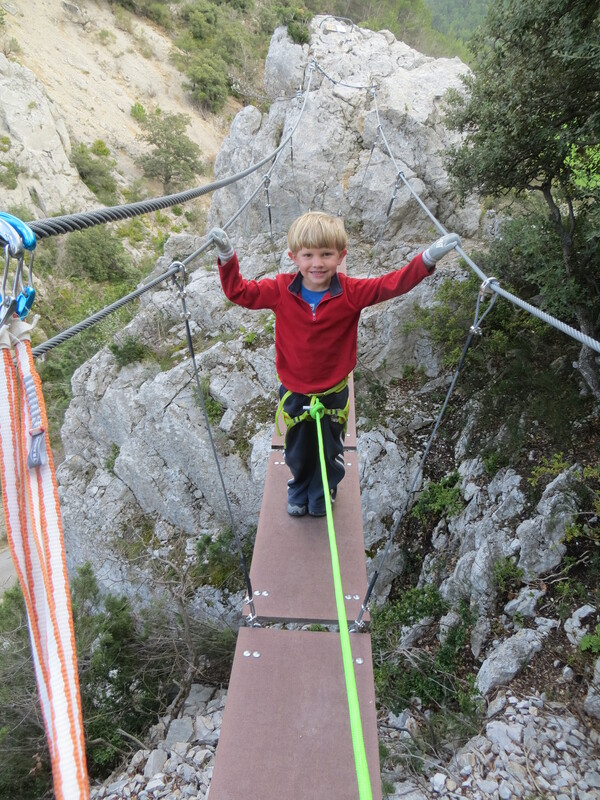 This particular route was designed specifically with kids in mind, more like a vertical park than a mountaineering objective, with closely spaced steps and a number of fun “obstacles” to look forward to (including a suspension bridge, “monkey bridge,” cargo net, and balance beam). It even climbs through a natural stone arch. It was super fun, even for jaded me. 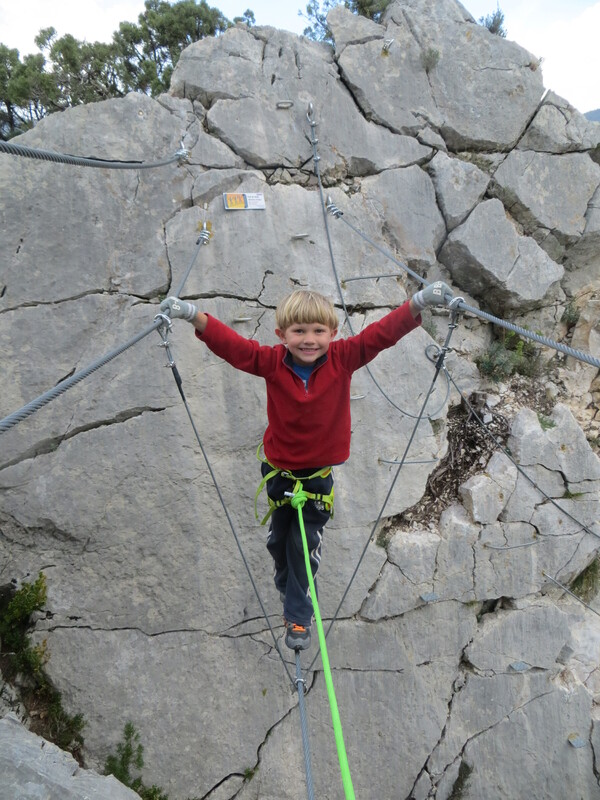 It really made me wish we had more via ferrata in the US; it’s a great way to introduce beginners to the mountains and creates no more impact than the typical hiking trail. It’s pretty awesome the way the local European communities embrace climbing, marketing it as an attraction and encouraging participation. There was a huge kiosk in the center of Buis describing in detail all the via ferrata, how to reach them, what equipment was needed and so on. The cargo net, with Buis, etc in the background. 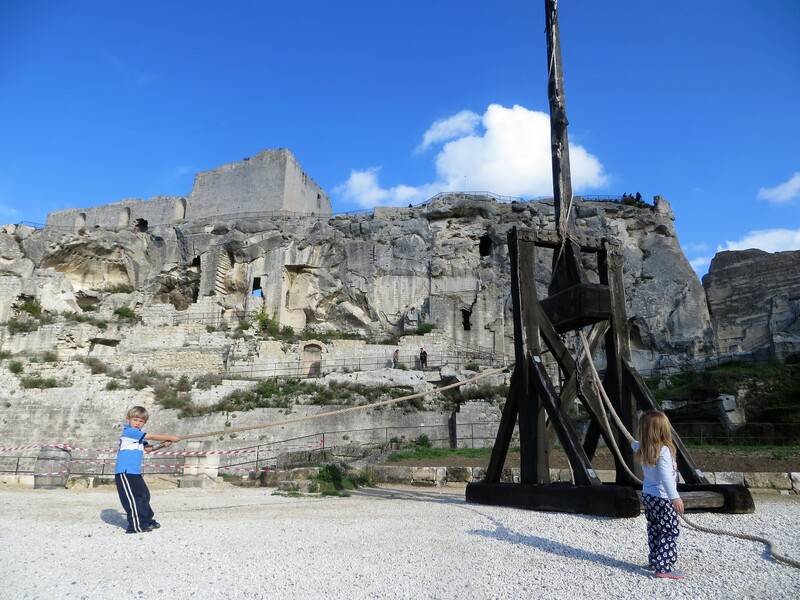 Castle of the day – Logan playing with a Trebuchet at Chateaux des Baux.